NOTE: This CRM admin also needs to be a Service or Global admin in AAD (Azure active directory). 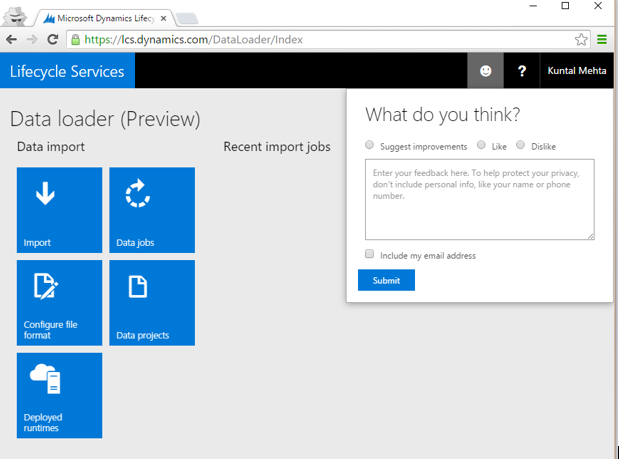 For detailed walk through of how to use this service – refer to the blog post Data Loader Service: How to Use (Part 2 of 2). We are making this preview available so that you can try it and let us know what you think. Your feedback will help us prioritize work to include the capabilities you need most. We ask that you give us your questions, suggestions and report problems from right inside of the Data Loader user experience, it’s the Smiley feature as shown below.